These general conditions apply to all agreements you close with Iris Hantverk AB. 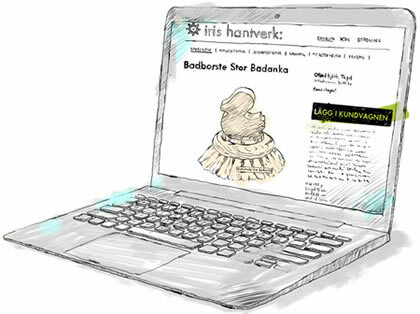 By ordering goods on Iris Hantverk AB you accept the Terms and Conditions. The agreement is established the same time as your order is accepted. If you are under 18 we require parental approval for the agreement to be valid. All prices on www.irishantverk.se is in Swedish kronor (SEK), including 25% VAT. At your order there is a shipping fee of 59 SEK. If you pay with invoice through our partner Svea Ekonomi there will be a flat fee of 29 SEK. If you choose to pay by partial payments through Svea Ekonomi will be an administration fee of 29 SEK / advice. When you pay with card there are no fees other than shipping cost. If paying by invoice, we collaborate with Svea Ekonomi AB. Invoice payment terms are 14 days, invoice fee of SEK 29 will be added. In order to purchase by invoice, you must enter your personal identification number or corporate identity number. You can purchase under the condition that you are registered in the population register in Sweden and is over 18 years old. You may not have any credit history. If your desired choice, to pay with invoice, is rejected, you can go back at checkout and choose another payment method. All invoices are by Iris Hantverk AB transferred to Svea Ekonomi AB. Invoices are sent by post. If payment is delayed there will be a legally required fee and a reminder charge. The penalty interest rate is 2% per month. Non-payment invoices are submitted to collection. Through our cooperation with Svea Ekonomi AB, you can subscribe for an account credit agreement and thereby be able to part-pay all your purchases over SEK 200. Choose the credit period that suits you best by checking the campaign options. The purchase can be refunded in full at any time before the maturity date. Standard credit check is done by having the data provided in the cashier, in some cases, this means that a credit report is taken. A copy of the credit report will then be sent to your home. If your desired choice, partial payment, is rejected, you can go back at checkout and choose another payment method. All invoices are by Iris Hantverk AB transferred to Svea Ekonomi AB. Do you have any questions you can call 08-51493113 for further information. Administration fee of 29 SEK per month added to all options. Examples of effective interest rate for purchases of SEK 10,000 posted for 12 months, 0% interest, SEK 195 arrangement fee and 29 SEK in accordance with the Consumer Agency's guidelines is 10.68%. We accept the following cards : Visa, MasterCard, American Express , Maestro and Diners . When you pay with a debit / charge card there will be no additional cost except the shipping cost of 59 SEK. Payment by card takes place under the current rules for online payment in Sweden and the EU. We use Svea Ekonomi hosted PCI DSS - certified card payments solution. The money is reserved on your account when ordering. All transactions are sent using SSL ( Secure Sockets Layer) very securely encrypted . No card numbers are saved . We use the latest security technology for credit card payments online 3D -Secure - a standard developed by Visa and MasterCard with intent to safely validate the consumer when buying online. 1. At checkout, select Credit Card as payment method. You will be linked to Svea Ekonomi secure payment server . 2. Select the type of credit card , enter the card number , expiry date, card security code ( CVC) * and the name of the cardholder. 3. Your data is sent encrypted and a check is performed to ensure that data is correct and that there are sufficient funds for the purchase. 4. Once the payment is accepted the money is drawn from your account, then you will be transferred via Svea Ekonomi back to Iris Hantverk AB , which then sends your order . Svea Ekonomi that handles our credit card payments meet the requirements of PCI DSS ( Payment Card Industry Data Security Standard ) . * CVC is the three-digit code that you will find at the back of your card and is used to increase the security of the payment on the internet. We only deliver within Sweden. Orders received weekdays before 11.30 are dispatched the same day. Rates are quoted in Swedish kronor , including VAT and you'll see a total price at checkout including any charges for shipping or selected payment method. Once we have received and confirmed your order , we will send an order confirmation to your e-mail. It includes information about your order. Always check your confirmation and contact customer service at 08-214726 or webbshop@irishantverk.se immediately if you have any questions. If you wish to change an order, in retrospect it can be hard when your goods are packed and shipped as soon as payment is received. The package is always delivered by DHL to your nearest delivery point. As soon as the package arrives at your delivery point you will receive an SMS notification that you need along with valid ID upon pick-up. You can also use your mailing id and valid identification to pick up your package. Contact Customer Service if you have any questions, we will help you ! There will be a shipping fee of 59 SEK ( no matter how much you buy ) . You can also choose to pick up your package in our store on Kungsgatan 55, Stockholm , and then pay no shipping . Normally, our delivery time is approximately 3 weekdays. If any problem occurs on our end , which means that your order can not be sent in due time we'll get back to you with further information about the order. You will always receive an order confirmation to your email address before we send the goods to you . All our packages are shipped by DHL to your nearest delivery point. Is your parcel damaged report it immediately to DHL. We always strive to deliver what has been ordered within the promised time , but if the delivery for any reason is delayed we ask you to immediately contact our customer service so we can investigate the delay. If you wish to cancel the delayed product, please contact our customer service. Iris Hantverk AB takes no responsibility for any damage incurred as a result of an announced deadline expired . All transport is by DHL to your nearest delivery point. Carefully inspect your package when you pick it up. If your package have any shipping damage , report it as soon as possible to us by email webbshop@irishantverk.se or phone 08-21 47 26. For packages that are not picked up there will be a fee of 300 SEK. It corresponds to the costs incurred to bring the package in return. It's important to us that you are happy with your goods. From the time your package has arrived at the post-office , you have 14 days purchase , exchange or return policy. Our condition is that the goods will be returned in the original condition , ie that it is not used and as well as the original packaging enclosed. Of course, you always have the right to open the package to check that the product works. When exercising the right of withdrawal will send you the item back to Iris Hantverk AB and pay for the return shipping and transportation risk . When we received the goods and found that this is unused and undamaged refunded the amount you paid for the item, return shipping costs deducted. First, contact our customer care center for the exchange or return of your item . Then send back the goods that you want to exchange / return along with a return form and a copy of your order confirmation. Return Form , click here. Contact us at Iris Hantverk AB on webbshop@irishantverk.se or call Customer Service at 08-214726 so that we can send a return form to you and reserve the new product . Print and fill out the returns form which you will find above. Return the product together with the return form and a copy of your order confirmation. Be aware of how important it is to pack the goods that you want to exchange in a way that they can not break in transit. Please use the protective materials that you received in the delivery. If you feel unsure or have any questions, please feel free to contact us and we will help you. If the item is destroyed or that we do not accept the exchange , you are charged a fee of SEK 300. Once we have received the goods and approved the change , we will send the new goods to you . If the new product is more expensive , you pay the difference in cash to your account before delivery and if it is cheaper we can adjust your invoice or alternatively refund the difference to the account that you specified in the return form. Return shipping costs 59 SEK will be deducted. Contact us at Iris Hantverk AB on webbshop@irishantverk.se or call Customer Service at 08-214726 so that we can send a return form to you. Print and fill out the returns form which you will find above. Remember to include the reason for return. Return the product together with the return form and a copy of your order confirmation. Be aware of how important it is to pack the goods that you want to change in a way that they can not break in transit. Please use the protective materials that you received in the delivery. If you feel unsure or have any questions, please feel free to contact us and we will help you. If the item is destroyed or that we do not accept the return , you are charged a fee of 300 SEK. Once we have received the item and approved the return we will adjust your invoice or alternatively refund the money to the account you specified in the return form. Return shipping costs 59 SEK will be deducted. You, the customer has always the right to unpack the goods and check them . If an item is incorrect or damaged contact Customer Service immediately at webbshop@irishantverk.se they will help you how you should proceed . Please attach digital pictures of the products/damage in the mail contact , to simplify the matter. In case of a dispute Iris Hantverk AB follows Allmänna reklamationsnämndens recommendations . Please note that shipping charges for returns and exchanges are paid by you the customer. However, if it concerns a complaint because of damaged goods or that we dispatched the wrong item , we will refund all shipping costs while paying back what you spent for the goods . Iris Hantverk AB will refund the consumer within 30 days in the event the consumer on proper grounds cancels an order or to get money refunded . By confirming a purchase at irishantverk.se you agree on recieving newsletter with offers and inormation. You can at any time change your references at our website under newsletter. Iris Hantverk AB is exempt from sanction for failure to perform any obligation under this Agreement if such failure is due to liberating factor as described below and the circumstance prevents, hinders or delays the performance. As the liberating factor to be considered including government action or omission, new or amended legislation, conflict, embargo, fire, flood, sabotage, accident, major or other type of natural disaster. The force majeure includes government decisions that affect the market negatively and products, such as restrictions indication, warnings, bans, etc., abnormal decline in the market and the company exposed to criminal activity that affects the business. Iris Hantverk AB follows the laws of Distans- and hemförsäljningslagen, konsumentköplagen and E-handelslagen. In any dispute, Iris Hantverk AB follows the Allmänna Reklamationsnämnden recommendations.